Young people can often feel disconnected when it comes to politics and find it difficult to relate to political issues despite these areas having a crucial impact on their everyday lives. 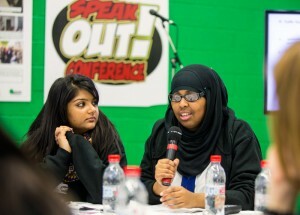 How do you show young people that their opinions and ideas can make a difference, provide a way to engage them and give them a platform to speak out on the issues that are important to them? 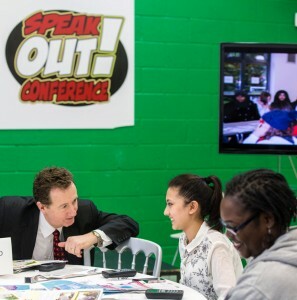 Ealing Council invited a selection of school children of different ages to their annual ‘Speak Out’ conference to voice their opinions on local borough issues. Organisers wanted students to take an interest in the areas that affected them as well as informing them about the UK Youth Parliament and encouraging them to become members. Hosts wanted to give students the confidence to come up with the changes that they wanted to see implemented by the Council. To achieve these aims, the session needed to be interactive, creative and inspiring. A series of votes using Messenger handsets were carried out which enabled students to give their opinions on topical issues including: young people and the police, drugs and substance misuse and school lunches. Results were thought provoking and everyone took part. In one result, a significant 90% of students made it clear that they wanted schools to try out a variety of different food menus and food options. Students were also given a taste of policy making by coming up with the changes that they wanted to see Ealing Council implement. There was a real buzz amongst students as they got the opportunity to discuss and debate all the proposals with their peers. Students then voted for their favourite options with the two most popular being put forward to the Council for further consideration. They were also able to have their say in who they wanted to represent them in the UK Youth Ealing election by voting in a preliminary vote for a new member of the UK Youth Parliament. The event showed young people that they could make a difference in the areas that affected them by discussing, debating and voting ideas. It gave them a platform to voice their thoughts and for the Council to hear and act upon what they were saying.